This is a true story of how technique combined with knowledge of pressure points helped police officers do their job while at the same time minimizing potential injury to the assailant. The police officers were having trouble. A man under the influence of drugs was causing a disturbance at his job site. The police were called to intervene, but the assailant wasn’t easily controlled. The police were trying to handcuff him and take him into custody, but to no avail. The assailant was resisting. A call for help went out to a supervisor, one of my students. When he arrived shortly afterwards, he found four officers around the assailant, now on the ground face down. The assailant had his hands locked together across his chest and the officers had been unable to get him to unlock his hands so they could handcuff him. It should be noted that the police officers had exercised considerable restraint. They had not used any type of irritant spray (into the eyes), or resorted to using their night sticks, but their commands for compliance and physical efforts to wrestle the assailant’s arms free clearly were not working. 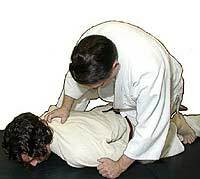 The officer's left knee is placed on the assailant's left side (near the chest) and his right foot on the right of the assailant. Officer's right hand grabs and pulls to the rear of the assailant's hair (locking the neck). The officer's left wrist bone is placed under the assailant's neck. 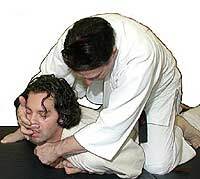 If the assailant has short or no hair, the officer uses his fingers (right hand) to pull back the assailant's neck. The officer rotates (backward and forward) the bottom of his wrist. 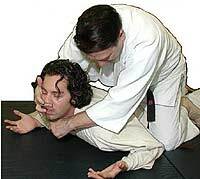 The wrist bone against the neck causes considerable discomfort with no damage to the assailant's neck and he will release his hands. The officer will then use his hand cuffing procedure.